This item is manufactured for you as ordered. Once the order has been shipped the items cannot be returned. Allow up to two weeks for production plus shipping time. Plan in advance. These are the same flags that we use for our in-house production of dye-sublimation golf flags for various customers. Made of 200 denier Dacron polyester, they sublimate very well. 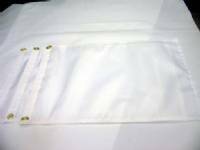 We provide these finished flags with heading and grommets. We also supply some scrap polyester for testing with every order. Testing the image quality with the scrap before using the finished flag will insure your sucesss and eliminate mistakes and misprints.